Christmas cryptolist puzzle. Engage students' brain with this printable puzzle. Enrich problem solving and vocabulary building skills with this downloadable, free puzzle to print out. 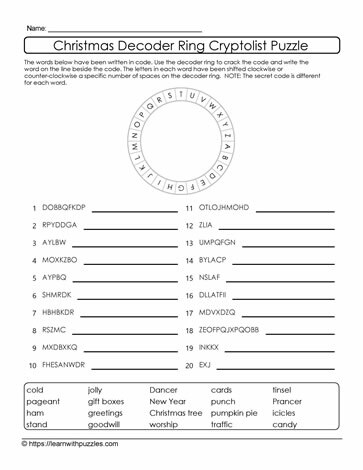 Decode the words using the decoder ring as a guide. Suitable for late elementary students in 4th, 5th, 6th grade classrooms. Homeschooled students will also find this activity supports curriculum based problem solving skills.